health | Adventuring Towards . . . I woke up to a flurry of texts in our EAPSI WeChat group (seriously one of the highlights of this experience, sharing our diverse China experiences with 39 other American grad students), comparing air pollution in our various cities – 284 in Shanghai and 349 in Beijing. There are several air quality apps available, and I check a few of them. I don’t know which one this woman in Shanghai is using, but I kind of love it. In addition to the “air soup” comment, there is a picture of a man wearing a mask next to . . . a glass of wine? One of the apps I use is called Air Quality China. It offers four monitoring stations for Beijing, with hourly data over the last 24 hours and daily data over the last 30 days. The other one is 墨迹天气, a Chinese weather app. One of my friends was surprised to hear that pollution changes as often as weather, but really all the weather apps here do pollution, too. It’s the most aesthetically pleasing weather app I’ve ever seen. The home screen is a litlte girl dressed for the day’s conditions, with the temperature, highs and lows, current pollution, and tomorrow’s forecast. Scrolling down, you can see an hour-by-hour forecast for the next 24 hours as well as a weekly forecast, plus a bunch of other information like what license plates are permitted to drive today, the date on the lunar calendar, fishing conditions, and what kind of clothes and makeup you should wear (true story!! The answer to the former always seems to be t-shirts, and the answer to the latter (taking into account temperature, humidity, and windspeed) was non-oil-based foundation.) If you click on the AQI number, it tells you where your current city is ranked among 626 of China’s cities – this morning, we were #619. But this morning the scene looked positively post-apocalyptic. The reading on 墨迹天气 when I woke up was exactly 300, which is the boundary between “Very Unhealthy” and “Hazardous”. The icon for Very Unhealthy is a full-fledged gas mask, like trench warfare style; later I saw that for Hazardous they don’t pull any punches and just use a skull. I laid in bed a little longer, reading those messages and staring out the window in despair. I wasn’t sure what I was waiting for, but now I think some part of my subconscious was waiting for some authority figure to recognize that the conditions outside were terrible and give me permission (or an order!) to not leave the hotel. Like when I was a kid in Minnesota and we saw the snow built up outside and watched the TV raptly, listening for a school cancellation. Alas, none came. I got up, put on my big girl pants and my face mask, and biked to work. I saw, like, maybe eight people wearing masks all day. But I also saw two people jogging, which just . . . what?! There is no way the overall effect of that activity is positive. I even wore my mask when biking to lunch. The lab window was open all day, so it’s really all an exercise in futility, but I do what I can. I asked one guy if he ever wears a mask, and he said “you get used to it”. There’s something powerful and sad in that statement. Powerful because, what an incredible machine the human body is, that it can take particulate matter as input when expecting a pleasant combination of oxygen and nitrogen, and still function normally. Sad because, while the human body (and mind, and spirit) can accomodate any number of terrible situations, it would be better if it did not have to. I’m still feeling 20% nauseous 80% of the time, so I picked at my lunch. On the way home, I saw out the window a worker squatting on top of the next building over, welding. The light is so distinctive, it immediately caught my attention. He was holding his hand up in front of his face, quickly lowering it and raising it again to ‘protect’ his eyes. And immediately, I’m back at the farm, watching the workers weld rebar. I remember the day Huo JieKuai repeatedly refused my offers to get him a welding mask, and came to work the next day with horribly sunburnt eyeballs. One of [the many] ways in which China seems like a paradox to me is the attitude towards health. I read a lot of China news, and there’s so many stories about this animal being poached or that animal being driven to extinction because of the Chinese demand for one of its body parts for traditional medicine. There are also stories about the growing demand for organic or, at least, trustworthy food sources after incidents like the melamine scare of 2008. My roommate suggested I buy fish oil pills to China if I had any old people to visit; tourists to the Bay Area always visit Costco or GNC to buy quality supplements in bulk. No meal with Chinese people would be complete without being gently forced to eat something because “it’s good for your body”. My life in China is one of constant chiding about my love of ice water, which is apparently terrible for you. But, at the same time . . . the official pronouncement of today’s air quality is that it is Hazardous, masks and air purifiers are Necessary, outdoor sports are Not Suitable, and open windows are Not Recommended, but 99% of what I saw was no masks, outdoor activities as usual, and “open ALL the windows!”. Smoking, despite a June 1 ban in public places, is still huge. Welding masks and other basic safety precautions used in American machine shops were scorned. Upon further thought, I realized that this is probably no different than the hypocrisy of American attitudes about health. We demand the best health care but don’t generally take the proper preventative measures. I think tanning bed use is still depressingly high, and most Stanford students don’t wear helmets while riding their bikes. I think we are all selective about the things we worry about, and the ways we feel capable of action. In China, there seems to be a high value on traditional medicine and ways of eating, but these traditional beliefs don’t seem up to the challenges of modern China, with 1.3 billion people competing for these scarce ingredients and some of the worst air pollution in the world. In the US, we place our trust in technology and reactionary medicine, and undervalue preventative measures. After work, I biked to the U-Center at 5 to meet Hannah, another EAPSI fellow. My work chair is broken in 3 places so I needed to invest in some pillows, and she was looking for a wallet. I bought an adorable and super squishy stuffed elephant, and then we stopped at Paris Baguette. I’ve been a somewhat vocal critic of eating American food in China, so it was with some self-loathing that I did this. But my reasoning is solid: American food in China is generally sold at American prices and is not as good as American food in America; while Chinese food in China is both way cheaper and way better than both American food in China and Chinese food in America. I try to enjoy what I have, when I have it. With that said, I haven’t been hungry in a few days and I’m trying to give my stomach what it thinks it wants if it will agree to then eat it. So I bought a garlic baguette, a cream-filled donut, and egg tarts (which aren’t even American, they’re Portuguese and imported so long ago they’re essentially Chinese). And I ate, and my stomach was reasonably happy about it. I went in to work at 1. Late, I know, but today is technically a holiday even if I’m not convinced my labmates know the meaning of the word. Also, stomach. At any rate, there were a few guys there when I got in, and they asked me if I knew it was a holiday. “Yes,” I said, “but you’re all here . . .”. And they called me hardworking! The only time I’ve gotten called hardworking for showing up at 1. One of my labmates had told me he was going to reinstall the operating system on the computer I’m using on Saturday, so I went in today hoping it was done. (As a reminder, this computer is hobbled both by the owner’s forgetting the administrator password, and by the faulty setup of Fortran. Basically useless to me as it was.) It was not done; in fact we appeared to have regressed, not only from Windows 8 to Windows 7, which I’m sure was intentional, but also from a mostly functioning computer that just wasn’t able to do the precise technical tasks I came to do, to a computer that could no longer connect to the internet. I hung around for a few hours, while no further progress was made. Tomorrow the “computer company” is coming to look at it. Before I left, I downloaded a few TV episodes. Might as well not let that 2 GB go to waste, right?? I hadn’t eaten since dinner last night, except for yogurt, but wasn’t that hungry until dinner anyway. We went with the hotel restaurant again – a safe and convenient choice – and I introduced a few EAPSI people to some of my favorite dishes: shredded potato, muxu pork, and 地三鲜 (eggplant, potato, and green peppers). We lingered over dinner to talk, mostly about Chinese. I’m the only one who had studied it before, so I ended up trying to explain some features of pinyin that I had found confusing when I first studied Chinese, like the fact that nü and qu rhyme but that qu and chu don’t. I can’t get over how brave these people are for coming to China without knowing the language, although rationally I realize I did the same thing . . . like, 3 times. I didn’t feel great when I woke up this morning (maybe the spicy food from yesterday, maybe just my period starting). I faced a difficult question – what about Mass? My stomach was vaguely unhappy – it could get worse, but it was currently not bad enough to not go to Mass . . . just bad enough to not go right now. The problem is that 8:30am is the last Mass at West Church, and one of the later ones in the city. I ended up waiting another hour, feeling slightly better (or at least not worse), and deciding to go to Xishiku for their 10am Mass. Every church in Beijing is at least an hour away by whatever various combinations of walking, biking, buses, and subway that I use. This one was no exception: I biked to the 五道口 station, took two subway lines, including a lengthy walk to transfer, and then walked another kilometer to the church. Xishiku, more commonly known as the North Cathedral, is beautiful. I liked the church, the music, and the length of the homily (of middling-to-low importance to me usually, but a serious consideration at Chinese Mass), plus the option of 8am or 10am Mass is nice. After Mass, the children’s choir sang a song for their dads, and the big screens showed pictures of them with their dads (hard to see here). It made me think of my dad! Happy Father’s Day! I felt weak and tired after Mass, so I took a taxi home. First time using Kuaidi, a Chinese taxi-calling app, and it was wildly successful! I spent the afternoon in the hotel, taking it easy. I took some charcoal caplets, took a three hour nap, drank some yogurt, read a lot. I had dinner in the restaurant downstairs – we just found out that you can order food there, and it is so nice to know that I can get a huge variety of good food at good prices downstairs any time before 8:30pm! During my year in China, I had several encounters with TCM (Traditional Chinese Medicine). Funny thing – no matter if it was prescribed for asthma, diarrhea, or an infection, it always smells the same. I swear, I could smell TCM from a mile away! It works sometimes, though. It cleared up my infection and I didn’t die of diarrhea, so I really can’t be too harsh on it. I’m not feeling too great today. I started shaking last night when I got home and it hasn’t gone away, almost 24 hours later. It’s the kind of thing that feels like my entire body is vibrating. It usually happens when I take my fast-acting inhaler too much, but I haven’t really been taking it that much recently, and not at all in the last 36 hours. I’m not really sure what’s going on; the family gave me some Chinese medicine last night and I’m wondering if it had something in it – crack, possibly. Later, as a sort of control, I took a small amount of the medicine again and had the same, although slightly less intense, reaction. For many centuries, ma huang was used by Chinese herbal doctors to treat asthma and general malaise. Eventually, scientists working in the West identified and extracted the key component of the plant, ephedrine. This was then imported back into China in its purified form and sold to pharmacies prescribing western medicine. Ephedrine? That sounds familiar, in the same way that MSG and ketamine sound familiar – not 100% sure what they are, but I was raised knowing they were bad. Ephedrine is a sympathomimetic amine commonly used as a stimulant, appetite suppressant, concentration aid, decongestant, and to treat hypotension associated with anaesthesia. Oh yeah, ephedrine was in all those weight-loss drugs that were banned. It’s also similar (chemically and otherwise) to methamphetamines. Well, I figure that about explains the reaction, doesn’t it? The funny thing is, I don’t have any recollection of my asthma improving after I took it! We meet at Baicheng at 7:30 (just for the record, this was a mere 2 1/2 hours after the football match ended last night) to set off for our day trip. Nathalie’s running late so as we cram the five of us into the taxi we urge the driver to go faster – we have an 8:10 bus to catch! At the bus station, XuLei goes to buy tickets while we go to find our bus. The woman at the information says, “Changtai? There are no buses to Changtai from here.” Ah, the old wrong-bus-station trick; I’ve fallen for that one a good many times. But this was apparently part of the plan. XuLei comes back with tickets to Changtai as well as bus passes that will get us to the correct bus station. It’s a short drive away, a small transportation hub hidden so cleverly in a mall that none of us knew it existed. We navigate our way through the station, finally get on our bus to Changtai, and I fall asleep. XuLei wakes me up after calling the rafting place, our destination in Changtai. Due to the flooding affecting the entire province (except our island, apparently), there is no rafting today. I understand that weather affects outdoor activities, but what makes this something that could only happen in China is that a) XuLei ordered tickets online last night and b) the place was also closed yesterday. XuLei confers with the driver and finds an alternate destination; a few minutes later we are dropped off on the side of the road. It’s the JiaLong theme park, a completely artificial wonderland filled with a zoo, fruit garden, hot springs, pools, fishing, and a [90m] ‘mountain’. Despite a very enthusiastic employee, we unanimously decided to seek greener pastures (or at least higher mountains). 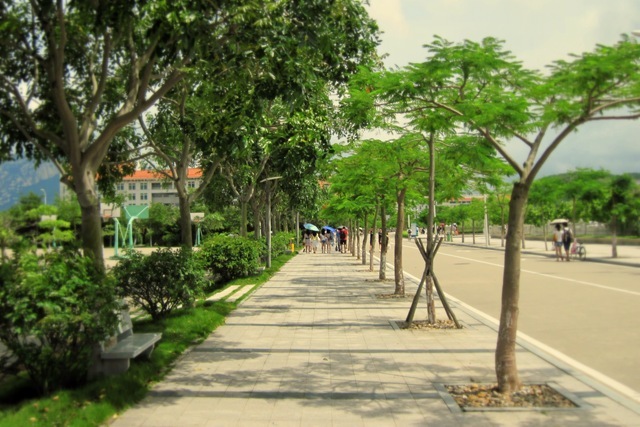 But there were no direct buses to our next choice, Xiamen University’s campus in Zhangzhou. I mean, technically there were no direct buses to anywhere, but we did manage to get on a bus to Xiamen after walking a ways and standing on the side of the road looking helpless (fortunately, sometimes I happen to excel at). The vehicle we boarded was the bus equivalent of the Jeepucha from the farm. The Jeepucha was the very first stick shift I ever drove, a feat that was complicated somewhat by its complete lack of power steering, suspension, or brakes of any sort. The seat belts were sketchy – heck, the seats were sketchy – and only a few windows remained. This bus was pretty much like that. It sparked a mild debate between us as to how old this thing could be; Aleid thought 30 years but Nathalie and I disagreed, saying that vehicles don’t get driven like this and last 30 years. XuLei guessed 10. It got us safely to DongDu, where we caught a bus to Lundu, where we got on the ferry to Zhangzhou. Yeah, we felt a little silly about our route thus far, which had taken us from Xiamen to Zhangzhou, back to Xiamen, and now returning to Zhangzhou, but we agreed that the scenic tour had been nice. We took a local bus from the ferry to the campus, where we decided to have lunch (as it was already noon). We first had snacks, some 烧仙草. Lester described it as “milk with peanuts, red beans, stuff, and other stuff” (where the other stuff is coconut jelly and suspicious black jelly), but I’m personally partial to the name of the stand at West Gate: Fubu Burns the Fairy Grass. Then we went to a restaurant for lunch, where we were treated to some truly notable service. They really don’t see many foreigners out there in the country, and the poor waiter was so confused that he asked XuLei if she could speak Chinese. Then, as we ordered food, he offered a commentary on whether or not we would like it. “Chinese food is not the same as Western food,” he began, going on to tell us that “we aren’t accustomed” to eating this type of fish and that type of meat. I’m surprised he didn’t bring us forks and knives, actually. I would have been insulted by how condescending he was if I hadn’t found the whole thing so hilarious. It was my first real meal in about 6 days, and even though it was quite hot my stomach had no problem. We all struggled a little with the hot peppers, but luckily discovered that lychee really help to put out the fire. They may be my new addiction . . .
We walked around the campus after lunch, seeing XiaDa students (including XuLei) spent their freshman and sophomore years. It’s a beautiful campus, with many of the things that make our campus on the island so beautiful – water and mountains, fusion architecture, tropical plants. But it’s only a few years and the trees aren’t very big, so I think in maybe 10 years it will be able to compete with its big brother. The main draw is the library, a piece of architecture so famous that there was a CCTV special on it. It’s huge, airy, open, and fabulous. There’s a giant courtyard/arboretum inside illuminated by sunlight (filtered so it’s not so harsh) and filled with couches and plants. As soon as we sat down on one of said couches, we were approached by group after group of students wanting to get their pictures taken with us. What can I say, we’re cute! Lester felt left out because no one wanted a picture with someone who looks Chinese, so I took a picture with him. And we got someone to take a group picture, too. Then it was time to go home. Bus to the ferry, ferry to the bus stop, bus to campus. 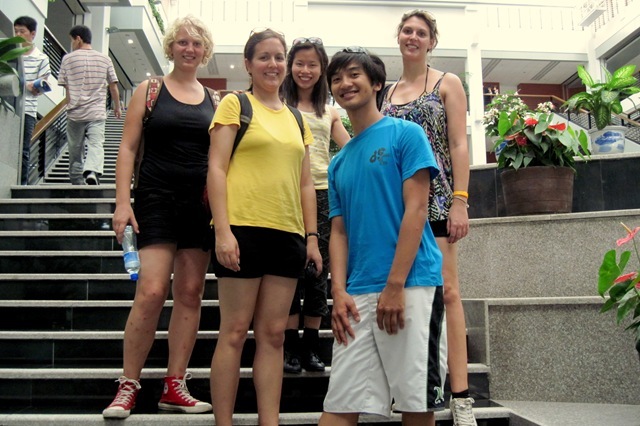 What a day – and all while we were “adventuring towards rafting in Changtai”! Said goodbye to Kristina this morning. There are no more Slovenians now, not until I go visit them. It is a sad day for Xiamen. I felt much worse this morning, so I spent the day in my room. I finally finished a Chinese movie I’ve been working on, 非诚勿扰 (If You Are the One). I can tell it’s funny (about a guy looking for a wife) but it’s much harder than the other trashy movies I’ve been watching, so I only pick up a third or so of the actual words. 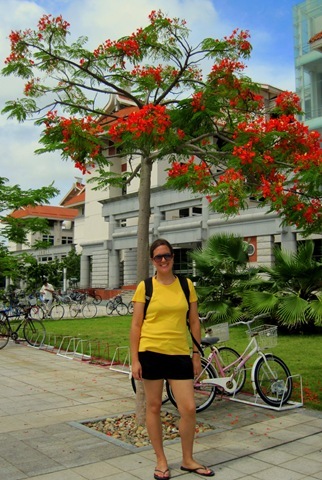 Today is my 10-month anniversary in Xiamen, but I didn’t do much in the way of celebrating. Still, 10 months is a long time, isn’t it? Most study abroad programs are for a semester – and a short one at that – so as far as study abroad goes, this year has been a marathon. I’ve been in Xiamen longer than any of last year’s freshman have been at TU! I did manage to get to Mass this evening, although the single apple I had eaten left me so weak I thought I was going to faint as I genuflected. Today’s Gospel ended with “手扶着梨儿向后看的，不适于天主的国”, or “He who looks back while his hand is on the plow is not fit for the kingdom of God.” Sweet, I learned the word for ‘plow’! I also caught most of Bishop Cai’s homily and what he said really caused me to think about the things in my life that accompany me on the straight and narrow, and the things that try to make me turn back. After Mass, I got a mango fruit juice from my favorite juice stand. It had been 5 days since I had tasted something so deliciously flavorful! My stomach felt fine afterwards – but even if not, I decided it was about time my mouth felt good. I went dancing only because Lester leaves on Tuesday and it was my last chance to dance with him. We did the cha-cha, it was good. I also danced three other songs and didn’t even pass out or anything. Now I’m back in my room. I ate a banana and apparently not all fruit is okay with my stomach . . . Also, there’s a cockroach in my room and I’m afraid to go to the bathroom because he’s over there. Seriously, though, I’ve seen smaller cats! I considered calling a friend to help me but I don’t like to think of myself as that kind of girl and would hate for others to. So I will just hold it in, I guess, and sleep with eyes open and mouth shut. The Uruguay-Korea game just finished, 2:1 with Uruguay continuing on. Great way to start off the final round, because that’s exactly the score I predicted! I’m currently 5th out of 10 in the standings of our pool – while it’s true that four of them have been lax in submitting their brackets, I am legitimately beating Diederik. Will wonders never cease? Update: I woke up at 3:47 a.m., an hour and a half after my alarm was supposed to go off. The US-Ghana game started at 2:30, but my alarm didn’t work and only the faint cheering on TV finally roused me. It was looking like a typical American game – Ghana had scored first, but Donovan’s goal (which caused the cheering) tied the game. No worries about missing the first hour of the game. I got to watch the last half hour and, when it was still tied, got to experience my first ever overtime football match. It’s kind of intense – they add 30 minutes to the game, which is 1/3 of the original length again! They worked hard, but lost 2-1 and we’re out of the tournament. I would like to extend a thank you to “the guys”, though: Landon Donovan, Tim Howard, Clint Dempsey, Jozy Altidore, Bocanegra, Bradley, and guy-with-the-long-name. You’re the first American football (well, American soccer?) players I knew and in fact, I learned your names right around the time I found out who Maradona and Lionel Messi and Cristiano Ronaldo were. You played well, keeping me invested through four long (one really long!) games, cheering for you all the way. Thanks for your hard work, and maybe I’ll see you on the field in the future? Especially you, Donovan – you’re cute. I felt so much better this morning that I broke my 24-hour yogurt fast in the afternoon to eat a cookie. It was a mistake, apparently. But I still had a good time this afternoon. I played two games of Catan with Aleid, Jelle, and Carlos, and won them both. After Carlos dominated last time, things are back to how they should be. I went to see Toy Story 3 afterwards, which was everything everyone said it would be. I really loved watching it in a theater full of young Chinese, hearing them exclaim “so amazing!” when Buzz flew across the room, and “so cute!” whenever the baby was on the screen. I’m out of sorts, though, perhaps an example of my mind mirroring my stomach. Seriously, what happened to those six capsules of charcoal I ate?? I’ve been anxious all day, worried as if I was running late to something important. But my pressing social engagements today were Catan, Toy Story, and a football game that I ended up skipping, so I don’t know what the big deal was. I guess XuLei got me a little bit down today, too. I love the girl, really, and think she is one of the most caring people I know. For example, as we were walking down ZhongShan Road she stopped to talk to a handicapped man who does calligraphy with his feet; when I asked how she knew him, she said that she just stopped to talk to him one day and gave him her phone number in case he ever needed anything. After walking a bit further, we passed a man doing calligraphy with his mouth – he didn’t have arms either – and she said she knew him, too. Another note on an aspect of Chinese culture that continually stuns me – bus etiquette. I’ve gotten used to the shoving during the boarding process and the way that guys will take seats that leave girls standing while everyone will immediately give up their spot for a pregnant woman or old person. But lately I’ve been shocked on a regular basis by what I can’t help but see as incredible self-centeredness. Two people get on the bus and head for the back, which has rows of four seats, separated into 2 and 2 by an aisle. There are only two adjacent seats left. In America, the first person would sit down and scoot over, allowing the other person to sit down on the aisle. In China, the first person plops down in the first seat (obviously, because it’s the most convenient) and sits there expressionless while the second person awkwardly climbs over them to the window seat. This is of course hampered by the proximity of the chairs (not enough room for me to sit straight) and the horrible bus design that puts some seats flat on the ground. Aaah! I can think of no circumstances under which this would be okay in America. Even if you were already sitting in the aisle, if someone wants/needs to sit next to you, social convention dictates that you either move over or stand up to allow them to get to their seat easily. I wonder, what customs do we have that other people think are rude? The habit of splitting the check, I know, but what else? I’ve barely been eating anything these last three days – my expenditures on yogurt have far outstripped expenditures on non-yogurt foods – but apparently that’s not enough. I’m snacking on charcoal like it’s candy tonight and tomorrow I’m only eating yogurt. Dear stomach – whatever’s bothering you will be out by tomorrow if I have anything to say about it. But I really resent these wasted few days. In addition to not doing much, I haven’t been eating much – and with less than 30 days left in Xiamen I don’t want to be taking days off. There are mangos to eat (and drink), bowls of malatang to savor, favorite dishes to enjoy again and again, and the girls at Coco who undoubtedly miss my daily visits. It’s just not fair. 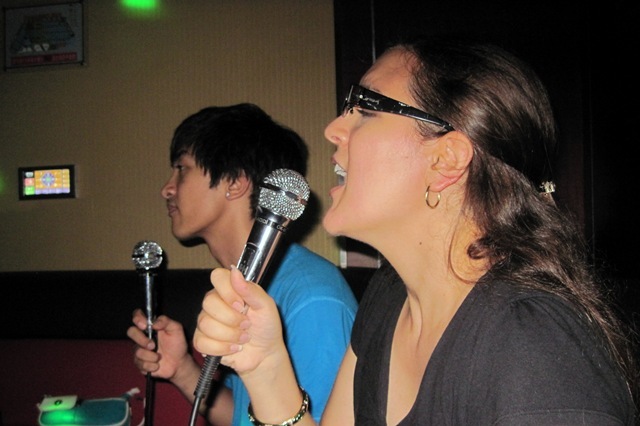 I wanted to do this last night but was up late enough as it was – so tonight I will share some of the Chinese songs that I discovered yesterday at KTV! Feel free to check them out on Youku links provided! “Listen to the church bells ringing / We are here in front of God, friends, and family to witness / This man and woman want to become husband and wife / Let us not forget how sacred this is / Are you willing to be with her forever, in life and death, sorrow and happiness / to love her, respect her, comfort her, and protect her / While the two of you begin your family? / Are you willing to do this? / Yes, I do. 简单爱 – “Simple Love”. Yeah, it’s a little creepy that the object of his affection is a young girl who appears to be 11, but the song is kind of sweet. The wind from the river blows your hair around / Holding your hand I have an indescribable feeling / I want to take you to my grandma’s house / Watch the sunset together / until we both fall asleep. / I want to hold your hand like this and not let go / Can love never have sadness? / I want to take you to ride bikes / I want to watch baseball with you / This way, there are no worries / Singing as we go. Little guy, you have a lot of questions, don’t you? / Why do other people read comics / while I study drawing / and speak to my piano? / Other people play games but I lean against this wall and memorize my ABC’s / I want a big plane but all I have is an old radio / Why do I have to listen to mom? / After you grow up you’ll start to understand this advice. 牛仔很忙 – “Cowboys Are Busy”. Best song of its kind since “Save A Horse, Ride A Cowboy”. Seriously. 对面的女孩看过来 – “Girl Over There, Look Over Here”. A classic. Learn left, right, up and down while you’re at it! 桃花朵朵开 – “All The Peach Blossoms Open”. I smile at the thought of this song stuck in your head, as it surely will be. Oh, oh / You’re even more beautiful than flowers / I can’t forget you / Oh, oh / fall has gone and spring has come / Remember our love. Much Better After Today, Thanks! I’m feeling better today, only hurting 15% of the time instead of yesterday’s 50%. I still didn’t go to class, though, because 15% pain plus 80% boring is just not worth it. But XuLei finally – after months of nagging – arranged a trip to KTV so I got dressed and went out with her, Lester, and two other Chinese girls. Karaoke is more than just singing here; it’s a way of life. Towns as small as Hunchun have whole streets filled with karaoke bars, while cities as big as Xiamen have numerous karaoke cities. There’s just no other way to describe these places – room after private room with supermarkets inside so you can sustain yourself during epic karoking (is that a verb?) sessions. We ordered up a nice mix of Chinese songs with a few English thrown in for Lester and I. We foreigners also tried a Chinese song or two, but the lyrics are all in traditional characters which turns karaoke into the vocal equivalent of doing brain surgery in mittens – it’s already so hard that it just seems unfair when this further obstacle is thrown in. All those characters I could never learn to write in my summer course when we learned traditional – 聽(听) and 還(还) and 過 (过) – came back in a flash of terror . . . I did a few English songs for everyone’s listening pleasure (I think?). They were delighted that to hear a song called Maria (they have no idea! ), and I think they liked “I Wanna Have Your Babies” although XuLei kept repeating the title over and over as if I would at some point realize what it means. Lester and I also did a duet together – “Glamorous” by Fergie, with me doing the spelling (“G-L-A-M-O-R-OUS”) and him doing the rapping about making money to buy me shoes. It was memorable. We spent a few hours there and then went for dinner, my first real meal in 48 hours. I’m subsisting on a diet of crackers, noodles in clear soup, charcoal pills, and yogurt. And my stomach is still unhappy. What is going on?? We’re not even back in America yet; save your hissy fit for the return. Tonight was another big game for America – although to be honest, each time America plays in this World Cup is a Big Game to me. We were playing Algeria at the same time as England was playing Slovenia, in the final two matches of the group round. Dave Barry explains it much better than I could: basically we wanted to win to ensure we would continue on in the tournament, but a tie could also be acceptable under certain circumstances. I went to Cafe del Mar to watch, but about half of the viewers were English or Italian and Xiamen’s sole Slovenian was there, so I was far outranked. Instead, I brought my computer and kept one eye on the live updates from the NYT. The English scored in the first half, putting the pressure on us to get a goal (as an English win was not one of the aforementioned “circumstances” under which we advanced). The second half dragged on with shot after shot in both games – most went wide or got blocked but one American goal was declared offsides (which may or may not have been true, but doesn’t actually matter. Again, see Dave Barry for explanation). The game clock reached 90 minutes, but a few more were thrown in for funsies – well, presumably there’s a reason, but I don’t know it. It was looking like Slovenia and England would advance, and Kristina was making jokes like “When an American asks you where Slovenia is, tell them it’s at the top of Group C!” But then I saw an animated crowd doing the wave across my screen below the words “GOAL: USA!” and I started screaming and jumping up and down. Landon Donovan had scored in the 91st minute, winning us the game, keeping us in the tournament, and putting us at the top of our group. Sweet! Back in my room, I took advantage of the daylight hours back home to call TU’s financial aid office. After a few weeks of these midnight calls, I think I have managed something akin to alchemy – I have turned fake money into real money! I’m on full scholarship at TU, which includes a stipend for food that comes in the form of Dining Dollars. Dining Dollars can only be used in the limited and kinda pricey on-campus food establishments and they expire at the end of the year. I mean, it’s kind of fun to take 15 friends to the sports bar for dinner on you, and the end-of-semester shopping sprees for literally bags full of candy bars are nice, and I’ll never forget the Drink Naked parties or the times I brought Blue Bell to class for everyone, but let’s face it – Dining Dollars are fake. They create an artificial economy where efficiency has no place and excess is encouraged. So hopefully this works out because, while I am missing American food, I dream of meals at real restaurants – not at The Hut. PS – As I hung up with the woman from financial aid, I closed with “bye-bye!” Yeah, that’s right, I just said “bye-bye” to a grown woman. I remember when I was embarrassed for the Chinese adults who would bid farewell to me in this way, thinking to myself We just don’t do that in America, that’s just for little kids. And college students who are culturally confused, apparently. I even type 88 (the Chinese shorthand for “bai-bai”) at the end of online chat conversations. That’s not the only Chinese typing tic creeping into my habits. I sometimes type 1’s at the end of sentences, which are required to select the most likely set of characters when typing in pinyin. And I have to restrain myself from typing “en” in English conversations. But . . . it sounds exactly like the noncommittal grunt I make dozens of times during any given interaction! “Oh” and “ah” and “hm” just aren’t the same . . .
As far as the Stomach Clench of Death can come at a good time, this one did. I was feeling fine in the morning – it wasn’t until after my one-hour, full-body massage that the cramping started. But then Eunice and I took the wrong bus and ended up on the mainland, which meant over an hour of public transportation, me moaning the whole way like a woman whose water just broke. I called in sick to class and spent the rest of the day lying in bed watching Gossip Girl (with Chinese subtitles!) and most of a Chinese movie. XuLei came by to tell me that my stomach is too cold and I need to drink hot water, but she also brought me light soup later so I’ve forgiven her. Apparently the monsoons I’ve been complaining about have caused actual damage. I can’t believe I didn’t know about this until now. For all that I occasionally feel integrated into this society, things like this remind me that I actually have an extension cord spanning the ocean and plugging me into things back home. Also, the Chinese government has started the gradual appreciation of their currency. So far it’s a whopping 0.43%, which means I only get 6.7969 kuai for my dollar instead of 6.8262. I guess I’ll have to deal with the high prices for the next month, but it’ll be in my favor when I close my Bank of China account and trade my RMB in for USD. If I take a whole month’s stipend home, I’ll have $250.11 instead of $249.04! Where to spend it? We learned the word 花蕾 (flower bud) in class the other day and I excitedly told XuLei (徐蕾) that we learned her name. Apparently a teacher used to call her Flower Bud in class and she didn’t like it, but I told her that the ‘lei’ in her name is nice. At any rate, it’s certainly better than the other ‘lei’ (雷) which means lightning but is part of the words ‘land mine’ (地雷) and ‘water mine’ (水雷). Don’t ask me why I know those words. The other day I went to dinner with a bunch of foreign friends and YongZhi. We ordered a fish, but there was some problem with it so the waitress started talking to YongZhi about it. He turned to us to translate and said, “The fish is very big – maybe two kilometers?” Wow, that’s gotta be some sort of record! We laughed pretty hard about it. We know what it’s like to say stupid things like that, so it was nice to hear a Chinese person mess up in such a harmless way. Sometimes I feel like I’m so over Chinglish and sometimes I think I don’t notice it anymore. But then I see a shirt that says CHECOLATE MELK in huge letters and I’m reminded of why I loved Chinglish in the first place. Also, I’m not sure if this counts as Chinglish or not, but my Chinese Mom – a 50+ year-old woman – was wearing a “Kit Kittredge: American Girl” shirt to church the other day. I loved it.